Rippedsheets.com offers custom NFC wristbands. These are perfect for concerts, special events, theme parks, sharing contact information, and more. The NFC world is growing fast and Rippedsheets.com is at the forefront with NFC-enabled wristbands. Rippedsheets.com’s NFC wristbands are one time use event bands. The wristbands are waterproof, tear-resistant, and can last multiple days if needed. These wristbands can be custom printed with event information, including variable data or barcodes. The NFC inlays, attached to the back (inside) of the wristband, can be encoded with custom information. They are easy to attach and have a strong adhesive with a tamperproof security seal that breaks away if removal is attempted. The wristbands come in adult size and kid size. Many smart devices already on the market are NFC-enabled as a standard feature, though many users are unaware of this ability. NFC stands for Near Field Communication and uses radio waves to allow different devices to communicate by tapping them or bringing them close together. With NFC, a user can check in on social websites, share contact information, change phone settings, and much more. Music festivals are now using NFC wristbands to enable the attendees to gain entrance into the concert as well as pay for goods with the wristbands. This allows for shorter lines and more time to enjoy the concert. At a food-tasting event in New York last year, the attendees were all given NFC wristbands. The attendees went around to different booths and tasted different samples. They were able to vote for their favorite with a simple tap of the wristband. Even Theme parks are using the NFC technologies to replace paper tickets, credit cards and hotel keys. Rippedsheets.com has the ability to help promote products and events with NFC wristbands using social media. NFC technology also provides another advantage of allowing the users to gather real-time results. Rippedsheets.com is not limited to just NFC wristbands. The company has experience with every category of NFC products including tags, cards, key fobs, and signs. They also have the ability to cut labels, tags, and cards to any shape or size, creating endless options for NFC products. Rippedsheets.com also has the ability to blind ship to customers, serving businesses that are looking to sell wristbands or other NFC products but do not have the ability to make them. Rippedsheets.com is a domestic source for NFC products, giving customers an added advantage of faster lead times and easier customer service. 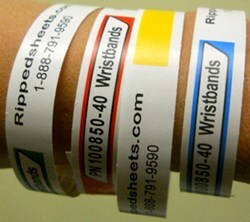 Visit the website or contact Rippedsheets.com at 1-888-791-9590 for more information on NFC wristbands.